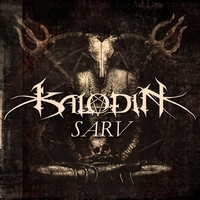 Kalodin is a band from Nepal who want to make a real breakthrough in the black metal world. They are distributing their music via the Indian label Frameshift Initiatives, and into their music there are also some vital influences from the Hindu religion, and on the last song Trishula you can enjoy genuine traditional Indian string music gently woven into the song. The title of this album is Sarv (means: to kill - in Sanskrit language), and since their debut album from 2010 The Bestial Ritualism Of Harlotry, there has been some changes in the band, and now Davin handles both vocals and guitars. Fallen Empire starts this EP with a power doomy kind of black metal with the mix of both power metal and black metal in one, and to put icing on the cake you get the Indian influence that is so evident on this album. OV Creation comes next and proves to be very competent power metal where you get all the pressure they have, and especially the drums lay a big effort in this track. Pathless is Davin's masterpiece with exploding guitar work added a lot of his raspy guttural voice to give the hardness of the metal another twist. Trishula is more standard power metal played very lively, and as before mentioned they have this clear Indian instruments to make it more exciting.